Azim Hashim Premji born 24 July 1945 is an Indian business tycoon, philanthropist and the chairman of Wipro Limited, a group company that holds Wipro Technologies, India's third largest software development companies. According to Forbes, he is currently the second richest Indian with a personal wealth of US$17 billion in 2010. In 2000, he was voted among the 20 most powerful men in the world by Asiaweek. He was also among the 50 richest people in the world from 2001 to 2003 according to Forbes. In April 2004, he was rated among the 100 most influential people in the world by Time magazine. His assets include 74% of Wipro. Wipro Limited, which dealt in hydrogenated cooking fats along with consumer products, grew from a company of US $2.5 million to a giant of $1.4 billion under Premji's leadership. Wipro Technologies, one of its group companies, is one of India's largest software companies and is ranked among the top 100 technology companies globally. Honored with Padma Bhushan in 2005. Azim Hashim Premji was studying Electrical Engineering from Stanford University, USA when due to the sudden demise of his father, he was called upon to handle the family business. 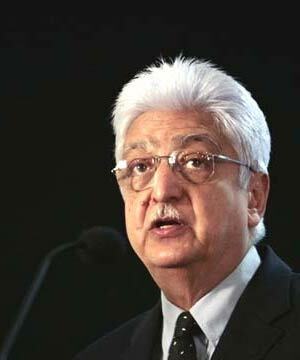 Azim Premji took over the reins of family business in 1966 at the age of 21. At the first annual general meeting of the company attended by Azeem Premji, a shareholder doubted Premji's ability to handle business at such a young age and publicly advised him to sell his shareholding and give it to a more mature management. This spurred Azim Premji and made him all the more determined to make Wipro a success story.